, a celebrated painter, was born at Brussels in 1602. He discovered an inclination to painting from his youth; and owed but little to masters for the perfection he attained in it, excepting that he learned landscape from Fouquiere. In all other branches of his art nature was his master, and he is said to have followed her very faithfully. At nineteen years of age he set off for Italy, taking France in his way; but he proceeded, as it happened, no farther than Paris, and lodged in the college pf Laon, where Poussin also dwelt; and these two painters became very good friends. Du Chesne, painter to queen Mary of Medicis, was employed about the paintings in the palace of Luxembourg, and set Poussin and Champagne at work under him. Poussin did a few small pieces in the cieling, and Champagne drew some small pictures in the queen’s apartment. Her majesty liked them so well, that du Chesne grew jealous, of him; upon which Champagne, who loved peace, returned to Brussels, with an intent to go through Germany into Italy. He was scarcely got there, when a letter came to him from the abbot of St. Ambrose, who was surveyor of the buildings, to advertise him of du Chesne’s death, and to invite him back to France. He accordingly returned thither, and was presently made director of the queen’s paintings, who settled on him a yearly pension of 1200 livres, and allowed him lodgings in the palace of Luxembourg. Being a lover of his business, he went through a great deal of it. 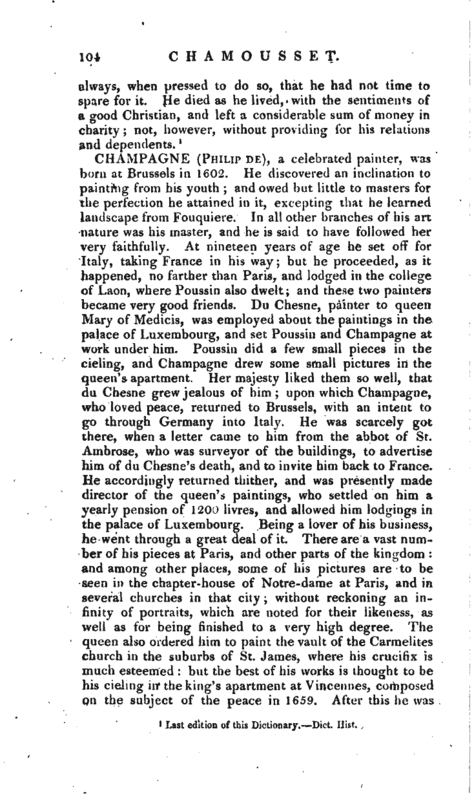 There are a vast number of his pieces at Paris, and other parts of the kingdom: and among other places, some of his pictures are to be seen in the chapter-house of Notre-dame at Paris, and in several churches in that city; without reckoning an infinity of portraits, which are noted for their likeness, as well as for being finished to a very high degree. The queen also ordered him to paint the vault of the Carmelites, church in the suburbs of St. James, where his crucifix is much esteemed: but the best of his works is thought to be his cieling in the king’s apartment at Vincennes, composed on the subject of the peace in 1659. After this hi. 1 was | made rector of the royal academy of painting, which office he exercised many years. He had been a long while famous in his profession, when le Brun arrived at Paris from Italy; and, though le Brun was soon at the head of the art, and made principal painter to the king, he shewed no disgust at the preference that was given to his detriment and loss. There is another instance upon record of Champagne’s goodness of disposition and integrity. 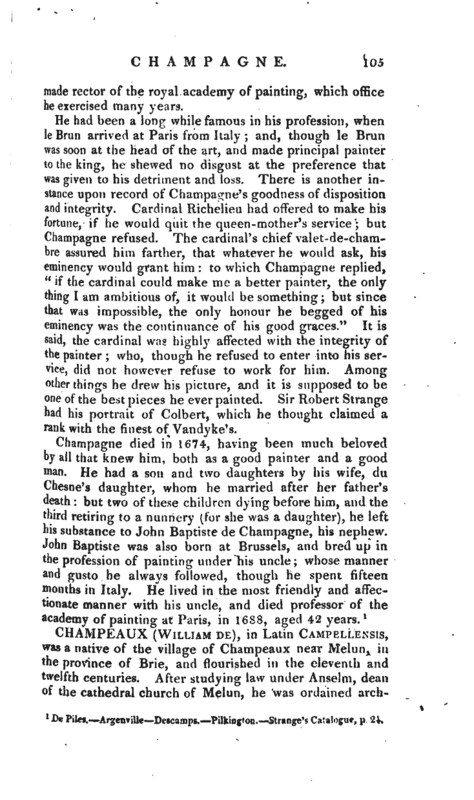 Cardinal Richelieu had offered to make his fortune, if he would quit the queen-mother’s service; but Champagne refused. The cardinal’s chief valet-de-chambre assured him farther, that whatever he would ask, his eminency would grant him to which Champagne replied, “if the cardinal could make me a better painter, the only thing I am ambitious of, it would be something but since that was impossible, the only honour he begged of his eminency was the continuance of his good graces.” It is said, the cardinal was highly affected with the integrity of the painter; who, though he refused to enter into his service, did not however refuse to work for him. Among other things he drew his picture, and it is supposed to be one of the best pieces he ever painted. Sir Robert Strange had his portrait of Colbert, which he thought claimed a rank with the finest of Vandyke’s. De Piles.—Argenville—Descamps.—Pilkington.—Strange’s Catalogue, p 24.